Qantas' first regular 787 services are a year away, but the airline is already announcing the initial routes so it can increase its proposition in deeply significant markets (and also begin preparations while avoiding possible media leaks). The well-flagged Perth-London nonstop service was announced first, but the first route to be flown will be Melbourne-Los Angeles from 15-Dec-2017. Perth-London nonstop is less about the actual market between Perth and London (it is small) and more about Qantas connecting the rest of Australia with a one-stop proposition via an Australian port with an experience that Qantas can intimately control. Even with Qantas' successful restructuring and cost base reduction, it will still need to command a yield premium. Nonstop to London, an unprofitable market not expected to turn to black in the short term, is also about the prestige and marketing value of being the only airline to operate Australia-Europe nonstop. Melbourne-LA was likely a late change, prompted by US rejection of its proposed JV with American Airlines. The JV would have resulted in American entering the Melbourne-LA market; Qantas' 787 will instead provide the necessary boost in presence of a market that has become more competitive. On 11-Dec-2016 Qantas announced the first route for its forthcoming 787 fleet: the well-flagged Perth-London Heathrow service that will take 17 hours nonstop once it commences in Mar-2018. This is four months after Qantas will start its first regular 787 route, Melbourne-Los Angeles (which was announced second, with this arrangement providing maximum publicity). Much is celebrated over the nonstop element of the route: it is the first time Australia and Europe are linked with a nonstop flight, and by flying from Perth to London nonstop Qantas will briefly operate the world's longest service. Not only will Qantas lose the title, it will do so to one of its keenest competitors: Singapore Airlines, which in 2018 will use A350-900ULRs to resume nonstop service from Singapore to New York – some 500 miles longer than Perth-London. SIA has yet to announce when New York will resume, but in fact it is probable that Qantas will have less than a year to be able to boast that it operates the world's longest nonstop flight. Qantas' operating the only Australia-Europe nonstop service (no other airline seems likely or has the strategic need) offers unquantifiable brand value and cachet for the airline about the 'nonstop' offering. Certainly the Perth-London market will be flown nonstop without the need for a transfer. Yet although the service will stimulate some traffic, this market is small (14% of total Australia-London O&D) and a fraction of the size of the London/UK/Europe market from Melbourne (26%) or Sydney (35%) – a reason Qantas does not fly from Perth to its European stopover hub in Dubai (although its partner Emirates does fly from Perth). 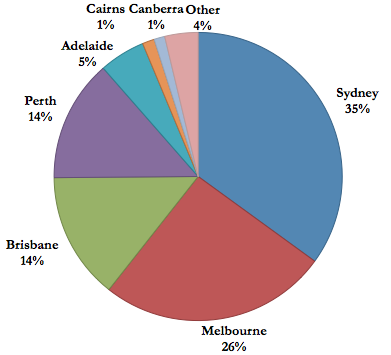 Perth (like Adelaide) was previously deemed so insignificant to Qantas that it lost all international Qantas flights. Perth now has a Singapore link back, but on the 737-800 instead of previous widebody services (there are also flights to Auckland). 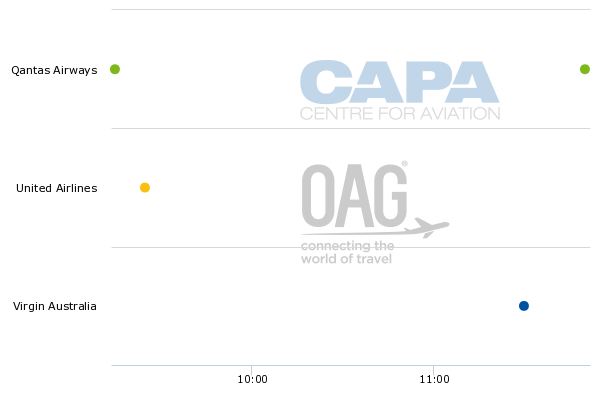 Source: CAPA - Centre for Aviation and OAG Traffic Analyser. The real operational potential is for domestic (and New Zealand) onward connections. By operating Perth-London nonstop, Qantas can use Perth as a stopover hub, creating a one-stop link from elsewhere in Australia to Europe. Without Perth having a nonstop link to Europe, two stops would be involved. Outside the Perth market the change may seem incremental: Qantas can still offer a simple one-stop transit to its core markets of Sydney, Melbourne and Brisbane, with the hub in Perth instead of Dubai or competing locations such as Singapore and Hong Kong. Perth will enable some faster connections, making for a shorter overall journey time, but Qantas will be able to link more Australian cities to London with one stop since Perth serves more Australian cities than do other stopover hubs. Admittedly those cities and towns are small, but the benefits are incremental. Further, Qantas will be able to offer an entire Qantas-operated one-stop journey from Australia to London. Previously with one-stop Qantas has only offered Melbourne and Sydney, while Emirates has been the sole Qantas partner one-stop option from Adelaide, Brisbane and Perth. Enough Australians remain sticky to Qantas-operated, and not just Qantas-coded, flights to justify the strategic importance. Qantas can also have greater control over the transit experience and suitably brand it at a time Qantas is placing renewed emphasis on its unique "contemporary modern" offering, which seems to resonate well – unlike the grand and, at times, overwhelming experience at Dubai International or other large transit hubs. This boosts Qantas' overall proposition to individual travellers and corporate contracts. While Qantas may make a loss carrying passengers Perth-London, it reaffirms its value when making profits to America, some Asian ports and (earning very handsome profits) – domestically. More broadly, Qantas and Emirates add value by increasing their proposition for a European journey that can be nonstop or via Dubai. In the future there may also be an Asian one-stop journey again on Qantas. These (potentially) three options suit different passengers and varying needs. Other airlines and partnerships will not be able to boast so many options; it is always Cathay through Hong Kong, Qatar through Doha, or Singapore Airlines and the Lufthansa Group via Singapore. The ability of Qantas and Emirates to offer the options reflects the comfort and trust they have with each other to support such complexity in their partnership. Qantas announced Perth-London nonstop flights without announcing any changes to its two existing London Heathrow services – Melbourne and Sydney, both via Dubai on the A380. As CAPA has previously noted, there is the option for Qantas to reroute an existing service to offer another transit hub or reach a different European city with one stop. Qantas' former London Heathrow slots have been leased out, not sold, but it is unclear what the arrangements are for Qantas if it wants to add a third daily service. Presumably Qantas has satisfied itself that slots will be available, before announcing the service. Three flights a day to London from Qantas is simply too many, at least at this time. Even two daily flights has been too much, but Qantas has been unwilling to deal with the likely public and political outcry from only having one daily flight (even which would likely still be unprofitable). Qantas' second London service has lost relevance and Qantas has retimed it to shorten the London ground time and increase overall fleet utilisation, but at the expense of arriving and departing at off-peak hours – the cost of peak arrival and departures was not being given the rightful yield premium. On a strict profit/loss basis, Qantas would not fly a single service to London – and would not have done so for many years. From Western Australia losing all Qantas international flights to being the home of Qantas' first announced 787 service – briefly the world's longest flight as well as the only (for some time) Australia-Europe nonstop flight – amicable relations have been restored between Qantas and Perth/Western Australia. Qantas is stressing its benefit to the state by having Australian travellers choose to stop over in Perth instead of other intermediates such as Dubai, Singapore or Hong Kong. This will be difficult to achieve; not even Dubai has caught on with Australians the way Asian cities have; Guangzhou may appear more exotic than Perth. Nonetheless, with government and tourism partners Qantas will be eager to continue to promote the possible benefit, in part so that governments can recoup the outlay in supporting the service. Qantas is flagging the potential of the 787 to operate to other European cities nonstop, even from Perth, but also on routes like Melbourne-Rome that could theoretically depart from eastern Australian cities since they will not be going as far into Europe as to destinations such as London. Nonstops to other European cities are highly questionable at best. London is by far the largest European market from Australia. Paris, let alone Rome, are much smaller and intermediate airlines will have a strong proposition, with frequency and price. Competition will continue to grow, from individual route/capacity additions to deeper partnerships. Air France and Singapore Airlines are mulling a partnership for Paris, which is typically the largest non-UK market for Australians visiting Europe - and one Qantas has served and left in the past. Besides London being bigger in passenger volume, it is also higher ranked for yield quality in all cabins. For other European cities Qantas will be challenged to attract a high enough overall yield to prevent the flight from being significantly loss-making. It should be remembered that even the base route – London, whether via Dubai or nonstop – is challenging as far as finances are concerned. Smaller European markets do not face the prospect of being less profitable, but rather being more unprofitable. It is not a high base to work from. Although Qantas' Perth-London announcement should have been no surprise, Melbourne-Los Angeles is a surprise. The route appears to be a last minute change from the assumed Melbourne-Dallas service. Prompting the likely change was the US DOT's Nov-2016 rejection of Qantas' proposed joint venture with American Airlines. (see: US DOT rejects Qantas-American Airlines joint venture under pressure of unchecked consolidation). It was expected that after the JV was approved American Airlines would enter the Melbourne-Los Angeles market, taking over Qantas' supplementary service. Qantas operates a daily A380 flight and then a supplementary flight with frequency that varies throughout the year but does not exceed three weekly flights, all on the 747-400. American would take over Qantas' supplementary Melbourne-Los Angeles services the same way it took over Qantas' Sydney-Los Angeles service. Qantas resumed San Francisco, with American entering Sydney-Los Angeles, and American entering Melbourne-Los Angeles would likely have meant Qantas growing elsewhere in North America – presumably Dallas. Qantas needs to grow in the Melbourne-Los Angeles market. 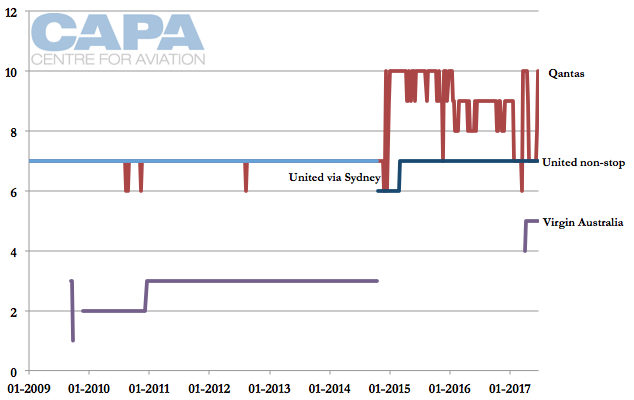 Qantas grew from seven weekly to upwards of ten weekly at exactly the same time as United transitioned from serving Melbourne via Sydney (light blue line in the graph below) to nonstop (dark blue line). With United bringing greater competition by offering a nonstop USA service from Melbourne, Qantas increased its proposition and market share. Virgin Australia resumes Melbourne-Los Angeles in 2017, further growing the nonstop Melbourne-Los Angeles market. In the broader Melbourne-North America market Air New Zealand will increase its focus on transit traffic via its Auckland hub, and Air Canada may add Melbourne – having added Brisbane to its existing Sydney roster (Sydney and Brisbane both linked to Vancouver). Changing from a sub-daily to near daily service enhances Qantas' proposition. From 15-Dec-2016 Qantas replaced its supplementary 747-400 service (upwards of three weekly) with six weekly 787-9 services, for almost a twice daily offering – much stronger compared to United and Virgin Australia. 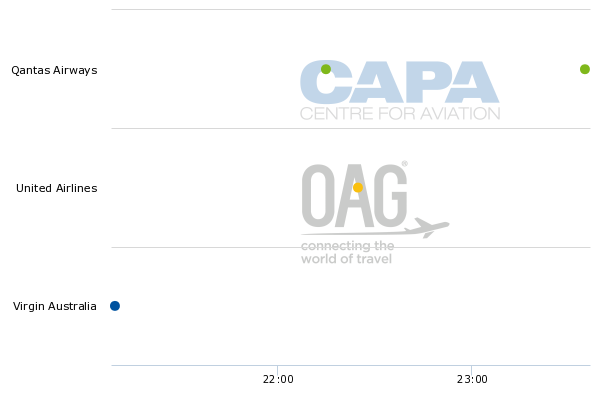 Qantas cites the change as growing the market by 1,400 seats, but this is by using selected metrics and time periods. A six weekly 236-seat 787-9 brings 324 more weekly seats than a three weekly 364-seat 747-400 service. Actual growth is not as important as having a more consistent offering throughout the year and week. Timing is not significantly important, so having multiple frequencies throughout the day is not as important as in other markets. Qantas' existing two Melbourne-Los Angeles services are timed broadly two hours apart. The first service gives a wider range of flights to connect with at Los Angeles while the second service allows for more relaxed Australian connections, since it departs late morning. Return sector departures from Los Angeles to Melbourne are currently scheduled with 1 hour and 20 minutes' difference. Qantas is enjoying the favourable crossroad it has reached. The airline is growing, route and personnel cuts have ended, the brand has rebounded (and been updated) and high profits are back even when considering the effects of lower prices, and the usually loss-making international division is back in the black. Qantas is being reborn, led by CEO Alan Joyce. With the new era comes a new aircraft. The 787 delivers strategic priorities with the London nonstop, and at the same time addresses the Melbourne market in the wake of US DOT's surprising rejection of American-Qantas anti-trust immunity. Qantas is enjoying a renaissance, but with an uncertain outlook in 2017, any excess of ambition will need to be tempered by caution. Finally, as for the 787 itself, after decades of growing its aircraft sizes – from the 707 to various versions of the 747 and then the A380 – Qantas is shrinking size to the compact 787, a significant indicator of global trends. A larger aircraft will however be needed for A380 replacement: Boeing is eager to have Qantas finally operate the 777X, while Airbus wants Qantas to operate the A350, and Qantas needs to resolve with Airbus the A380 orders where it has no intention of taking delivery. But those aircraft acquisitions will be modest, too. Qantas is long past its heyday of a strong global footprint, and instead is achieving – with large emphasis on partners – sustainability. Its traditional competitors in Singapore, Hong Kong may be bigger, but cannot necessarily deliver on a sustained future.